Animals communicate with one another when seeking to locate food, mate, or signal an alarm in the presence of threats in their environment. A variety of animals use pheromones to facilitate various phases of their mating behavior. Not all communication occurs between members of the same animal species, such as the facial expression and body language of our pets. The odor from a skunk’s spray is a highly effective defensive weapon used to ward off bears and other potential predators, and it is sufficiently pungent that it can be detected by human noses at downwind distances of one mile (1.6 kilometers). Animal communication is not limited to vertebrates, with some of the most interesting examples occurring in insects. Pioneering studies on insect communications were conducted in the 1920s by the Nobel laureate Karl von Frisch, an Austrian ethnologist at the University of Munich. He observed that a distinctive “dance language” is used by European honeybee (Apis mellifera) foragers to inform other bees in the hive about the direction and distance of food. A “round dance,” in which the forager executes tight circles, is performed when food is close to the hive—less than 160–320 feet (50–100 meters)—whereas a “waggle dance,” resembling a figure-eight movement, signifies food at a distant location. European honeybees also use a complex chain of communication modes that involve all five senses in a fascinating courtship ritual, with each signaling and triggering a subsequent behavior by the partner: The male visually identifies the female and turns toward her. The female releases a chemical that is detected by the male’s olfactory system. He approaches the female and taps her with his limb that, in the process, picks up the chemical. In response, the male extends and vibrates his wings producing a “courtship song,” a form of auditory communication. Only after this entire sequence is successively and successfully completed will the female allow the male to perform copulation. SEE ALSO: Insects (c. 400 Million BCE), Animal Electricity (1786), Neuron Doctrine (1891), Neurotransmitters (1920), Pheromones (1959), Animal Altruism (1964). Dance language among certain insects—in particular, honeybees—is well developed and has been extensively studied. 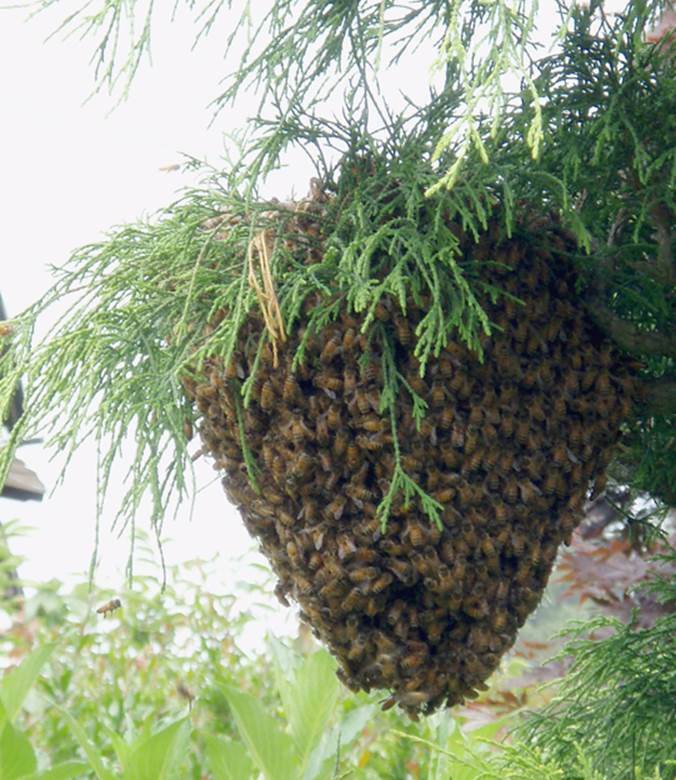 Here, the Apis cerana japonica honeybees surround their nest in Japan.